Track objects are used for routing and for general purpose drawing lines. There are 4 placed track segments in the image above, and another in the process of being placed. A Track segment is a primitive design object, a straight line of a defined width. Use tracks to define a straight line in the PCB workspace. Tracks are placed on a signal layer to form the electrical interconnections, or routing, between component pads. Tracks placed on a non-electrical layer are called Lines, where they are used as general-purpose drawing elements to create component outlines, instructional information, keepout boundaries, and so on. Tracks are also used in group design objects, such as dimensions and coordinates. Tracks are available for placement in both PCB editor and the PCB Library editor. In the PCB Editor different commands are used for placing tracks, depending on whether you wish place the track on a signal layer to route a connection, or place it on a non-electrical layer as a drawing-type line. Although tracks and lines are actually the same object, the difference is how the software behaves during their placement, which is why there are different commands. When a track placement command is run, such as Interactive Routing, the software monitors the click location and automatically adopts the net name of an existing object (such as a pad) under the click location. It also monitors and obeys any applicable design rules. When a line placement command is run, these monitoring behaviors do not occur. Click Home | Routing | . Click Home | Place | . Click or press Enter to anchor the starting point for the first track segment. If a routing-type placement command is being run and you click to start placement on an existing object, the track will adopt the net name of that object. The width will be determined by the applicable Routing Width design rule, but this can be overridden by certain interactive routing options, which are described in more detail below. Move the cursor to define the track segment and click or press Enter to anchor the end point for this first segment, which is also the start point for the next connected segment. Continue to position the cursor and click or press Enter to anchor a series of vertex points that define the series of connected track segments. Right-click or press Esc to end the current series of connected track segments. Press the * key to cycle through the available signal layers. If performing track placement a via is automatically added at each signal layer change, in accordance with the defined drill pairs and the applicable Routing Via Style design rule. Alternatively, use the Ctrl+Wheel Roll combination to move through the routing layers, each notch of the mouse wheel will move to the next (or previous) available signal layer. Press the + and - keys on the numeric keypad to cycle forward and backward through all layers currently visible in the design. Press the Tab key to access an associated properties dialog, from where properties for the track can be changed on-the-fly. Press Shift+Spacebar to cycle through the 5 available corner modes: 45 degree, 45 degree with arc, 90 degree, 90 degree with arc, and Any Angle. Press Spacebar to toggle between the two corner direction sub-modes. When in either of the arc corner modes, hold the or keys to shrink or grow the arc. Hold the Shift key as you press to accelerate arc resizing. Press the 1 shortcut key to toggle between placing 1 segment per click (the first 5 images just below), or 2 segments per click (the last image in the set just below). In the first mode the hollow track segment is referred to as the look-ahead segment. Press the Backspace key to remove the last vertex. Press Shift+Spacebar to cycle through the 5 available corner modes, press Spacebar to toggle the corner direction, press the 1 shortcut to toggle placement between 1 segment or 2 segments. A Track can be placed as a layer-specific keepout object or an all-layer keepout to act, for example, as a placement or routing barrier. Objects defined as keepouts are ignored during output generation, such as photo plotting and printing. A layer-specific keepout track is simply a Track object with its Keepout property enabled, an all-layer keepout is a Track that has been placed on the Keepout layer. To place a layer-specific keepout either place a standard Track on the required signal layer and then enable the Keepout property to make it a layer-specific keepout, or use the predefined Track keepout placement command, available in the sub-menu on the Ribbon at Home | Place | Keepout » Track. To place an all-layer keepout make the Keepout layer the active layer, then place a Track from the Ribbon (Home | Place | Line). During Interactive Routing the default behavior is for the software to ensure the track segments are placed in accordance with the applicable Electrical and Routing design rules. That means the software will not allow a new track segment to be placed so that it violates an existing track segment that belongs to a different net, instead it will clip the track segment to meet the design rules. This interactive routing behavior is known as the Routing Conflict Resolution mode. The default mode is Stop at First Obstacle (the current mode is displayed on the Status bar), press Shift+R to cycle through the available modes. The animation below demonstrate the behavior. The route on the left shows NetR10_2 routed with a 0.2mm wide track, as per the applicable Routing Width design rule. On the right net GND is being routed, for this net a different Routing Width design rule has been defined, with a preferred width of 0.3mm. Note that when the cursor is moved over the NetR10_2 pad, the GND net is automatically being clipped to ensure the applicable Electrical Clearance Constraint design rule is being met. The applicable routing width and clearance design rules are automatically obeyed during interactive routing. Unless the rules engine is disabled, the overriding behavior of the software is to always ensure that the routing width is within the range allowed by the applicable Routing Width design rule. A common approach is to allow a range of widths to be used for a net, to give the designer flexibility in fitting in the route, while satisfying the current carrying requirements of that net. Supporting this, the Routing Width design rule has Min, Preferred and Max settings which can be configured to allow a range of widths, or can be set the same to require a specific width. The width can also be configured as an Impedance, and can also have a different range specified for each signal layer. In the example below, the Full Query shows that the rule applies to all nets in the user-defined Power NetClass. 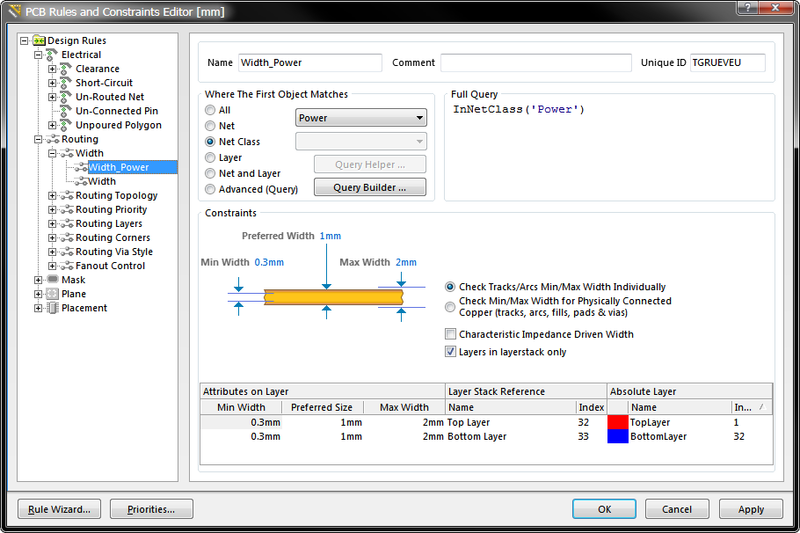 Note that in the tree of rules on the left of the dialog, there is another Width rule of a lower priority (because it is below the Width_Power rule). This lower priority rule targets all other nets on the board, defining their routing width requirements. A Routing Width design rule set up to target all nets in the user-defined Power NetClass, note the range of widths allowed. As the designer, you have a number of options that can help select the most appropriate routing width when you commence routing, these are configured in the PCB Editor — Interactive Routing page of the Preferences dialog, as shown below. Interactive Routing preferences, note the Interactive Routing Width / Via Size Sources options, these determine what size is used when you start a route. Note the Track Width Mode, this is set to Rule Preferred in the image above, so when the route commences on an existing net object, such as a pad, this is the width that will be used. The current Track Width Mode is displayed on the Status bar, press the 3 shortcut while routing to cycle through the modes. However, if the route commences on an existing track, then the Pickup Track Width From Existing Routes option will override the Track Width Mode, and set the new width to match the existing width. As the designer, you can also press the Shift+W shortcut to access the Favorite Interactive Routing Widths dialog (shown below), where a different width can be selected, or you could press Tab and open the Interactive Routing for Net dialog, and type in a new width value. The value chosen or entered must lie between the Min and Max settings defined in the applicable rule, if it does not it is automatically clipped back to the nearest of these. Note that pressing Shift+W will also switch the Track Width Mode to User Choice, reflecting that you have chosen to override the rule settings and manually select a width. Press Shift+W to pop this dialog and select a different width from you list of preferred sizes. While you are routing, there are a number of shortcuts that are available, for example you can press Shift+R to cycle through the available conflict resolutions modes, or press Backspace to rip up the last placed vertex (corner). To display a list of shortcuts while you are routing, press Shift+F1, or ~ (Tilda). A list of available interactive shortcuts will be displayed (shown below), either select the required shortcut, or press Esc to close the menu and then use the shortcut key sequence. Available interactive routing shortcuts, press Shift+F1 to display the list. If attempting to graphically modify an object that has its Locked property enabled, a dialog will appear asking for confirmation to proceed with the edit. Double click on the locked object directly and disable the Locked property to graphically edit the object. This method of editing uses the Track dialog to modify the properties of a track object. Individual track segments can be edited in the Track dialog. During placement, the properties of the track or line can be edited by by pressing the Tab key. Double-click on the placed track object. Place the cursor over the track object, right-click and choose Properties from the context menu. An Inspector panel enables the designer to interrogate and edit the properties of one or more design objects in the active document. Used in conjunction with appropriate filtering, the panel can be used to make changes to multiple objects of the same kind, from one convenient location.